Follow the directions below to enroll for classes in Student Center. Open the Student Center module. A new page will open. 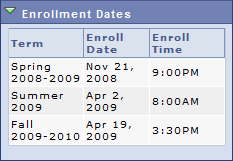 Your enrollment time is listed in the far right column in a window called "Enrollment Dates." The information below provides basic information for adding, dropping, swapping, and editing classes. The Office of the Registrar's homepage has more detailed guides. Open the Student Center module (located in Frontpage, Financial, and Student Record tabs). Locate the "Academic" section on the Student Center. Select Course Enrollment on the left side of the Summary Grid. The Add Class tab is the default tab when Entering Course Enrollment. Either use Search for your class, or enroll from Wish List/ Shopping Cart, or use Enter Class Nbr and click Enter to enroll. Put a checkmark in the box next to the class you want to drop. Under "Swap This Class," choose the class you are currently enrolled in that you wish to drop. Under "With This Class," choose the class you want to enroll in (use the instructions for Add a Class above). 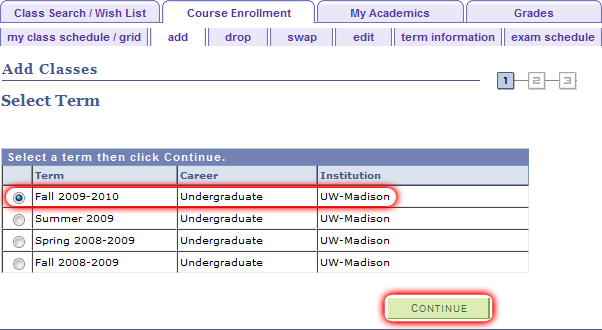 Choose a class to adjust the variable credit course or adjust the honors selection.